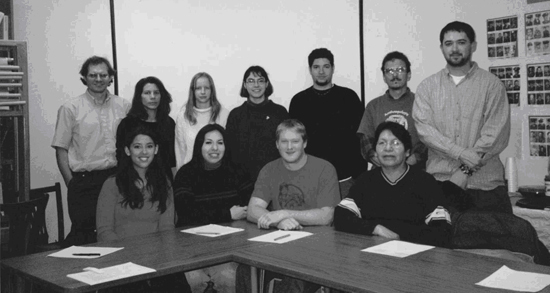 Omaha Language Class #1, OMAHA III, November 2001. L to R: 1st Row: Katie Morgan, Stacey Sanchez, Seth Lambert, Speaker Emmaline Sanchez. 2nd Row: Rory Larson, Natalie Luben, Tamara Levi, Deb Richards, Tony Schommer, Instructor Mark Awakuni-Swetland, John Gapp. Not Present: Speaker Alberta Canby. Photograph by Ruth Ford. Omaha Language Class #2. 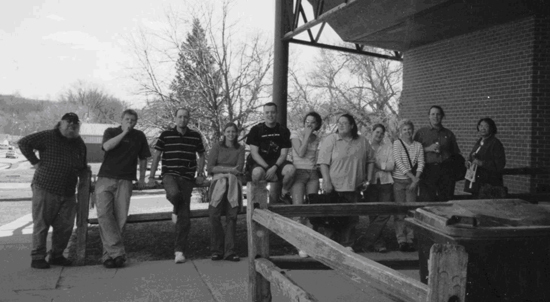 OMAHA II, Spring 2003, Macy, Nebraska. L to R: Loren Frerichs, Mike Hammons, Andy Pedley, Elaine Nelson, Matt Schumacher, Jessica Waite, Carrie Wolfe, Anna Ramsey, Wynne Summers, Kurt Kinbacher, Speaker Alberta Canby. Not present: Megan Merrick, Sara Anderson, Speaker Emmaline Sanchez. Photograph by Rory Larson. 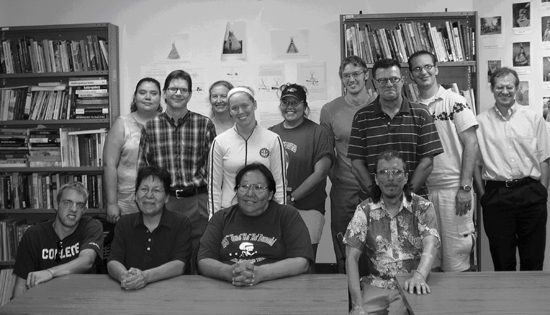 Omaha Language Class #3, Omaha I, Fall 2004. University of Nebraska-Lincoln. L to R: 1st row: Andrew Moore, Speaker Emmaline Sanchez, Speaker Arlene Walker, Instructor Mark Awakuni-Swetland. 2nd row: Shannon Saunsoci, David Neishem, Margaret Jacobs, Kalene Stremlau, Lorene Beaudette, Samuel Herley, Joseph Lamb, Matthew Garrett, Assistant Instructor Rory Larson. Not present: Speaker Alberta Canby.